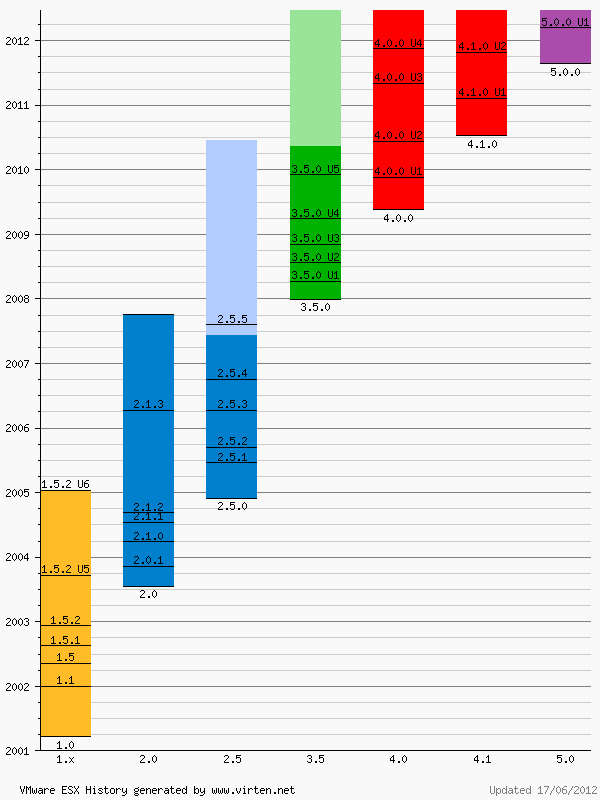 I really like tables because you can visualize everythng better. If you know this blog I am sure that you already know my ESXi and ESX build lists. 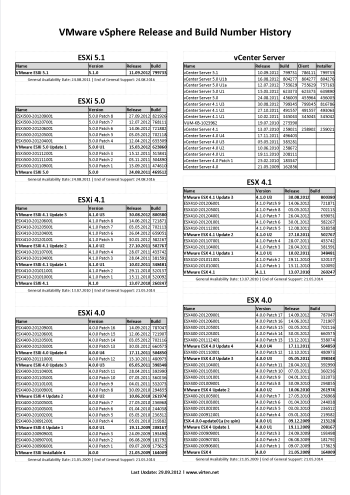 I've just updated both and published another table: Configuration Maximums, that is a comparison between all configuration maximums since ESX 1. Another cool document I want to share is my VMware vSphere Release and Build Number History PDF Format. I'm often sitting in front of an ESXi Host thinking "Oh, wich version was that build number please? And when has it been patched the last time?". This list really helps me out. Feel free to print and share! I am going to keep this list up to date. Please subscribe if you always want to have the latest version. If you change your hardware configuration without reinstalling your hypervisor you might run into an issue with the nic or hba port numbering. The ESXi host writes the PCI bus to vmnic mapping to a special configuration file. If you change the pci slot from your dual port nic for example you end up with 2 new vmnics. VMware has publish a security fix for their current ESX Server. There is a vulnerability which might allow an attacker to manipulate the traffic from a remote virtual device to cause the virtual machine to crash. Another vulnerability might allow an attacker with the ability to load a specially crafted checkpoint file to execute arbitrary code on the host. The Common Vulnerabilities and Exposures project (cve.mitre.org) has assigned the name CVE-2012-3288 and CVE-2012-3289 to this issues. Please note that this is not the privilege escalation vulnerability which in everybody's mouth at the moment. VMware products are not affected by this issue (CVE-2012-0217). I will keep this list up to date when updates are released. From the vSphere Client just select the ESX server within the Host & Cluster view. The version can be seen above the configuration tabs. In this example i am running ESXi Version 5.0.0 Build 504890. How to determine the VMware ESX(i) Build Version using SSH? If you are connected to the ESX console just enter "vmware -v" to get the Build number. This server is running ESXi 5.0.0 Build 702118, which is the current version as i am writing (June 2012).